Tech. Sgt. 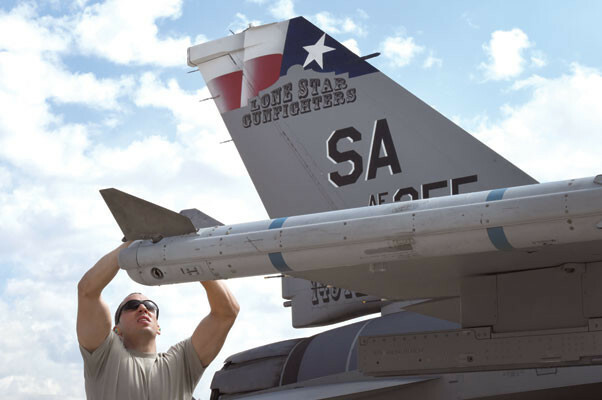 Federico Barrios, an aircraft armament systems technician, installs a fin on an inert AIM-120, advanced medium-range air-to-air missile during the loading portion of the 56th Fighter Wing load crew of the quarter competition April 8 at Luke Air Force Base. 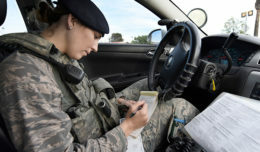 Barrios is a member of the Texas Air National Guard’s 149th Fighter Wing, headquartered at Joint Base San Antonio-Lackland, Texas, which is currently operating at Luke while San Antonio’s Kelly Field undergoes runway repairs. 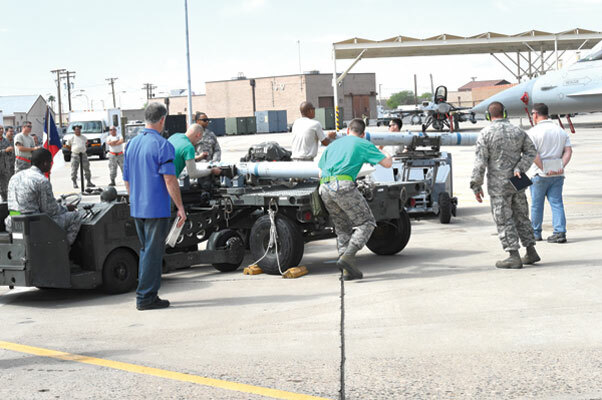 Members of the 310th AMU and the 149th FW, Texas Air National Guard, prepare to load inert AIM-120, advanced medium-range air-to-air missiles. 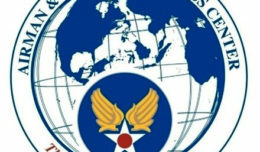 The 61st and 309th AMUs also participated in the competition. Master Sgt. 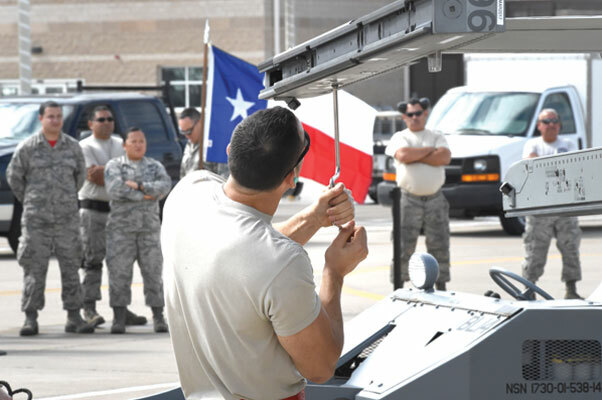 David Smith, left, an F-16 Fighting Falcon weapons standardization lead crew member with the 149th Maintenance Group, Texas Air National Guard, evaluates Staff Sgt. Brian Spangler, second from left, an aircraft armament systems technician assigned to the 310th Aircraft Maintenance Unit, inspect an inert AIM-120, advanced medium-range air-to-air missile, as part of the loading portion of the competition. 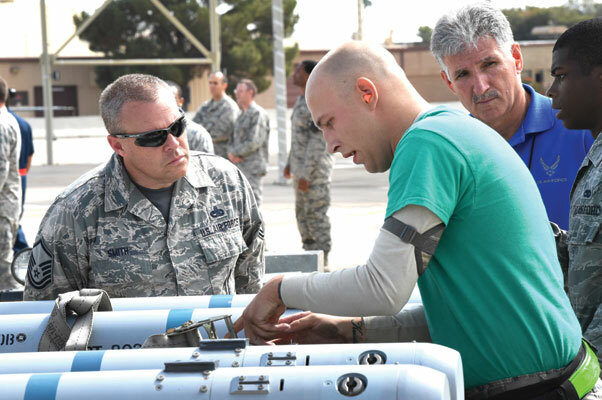 Also pictured are Steve Austin, second from right, an F-16 Fighting Falcon weapons standardization lead crew member with the 56th Maintenance Group, and Airman 1st Class Christopher Snead, right, an aircraft armament systems technician assigned to the 310th who is participating in the competition. Tech. Sgt. Mark Nash, an aircraft armament systems technician, inspects an inert AIM-120, advanced medium-range air-to-air missile. FROM LEFT: Senior Airman Robert Satter, Tech. Sgts. 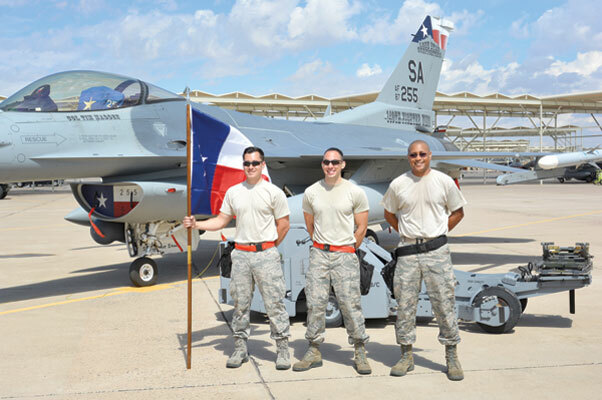 Federico Barrios and Mark Nash, aircraft armament systems technicians assigned to the 149th Fighter Wing, Texas Air National Guard, stand in a group following the competition. FROM LEFT: Tech. Sgts. 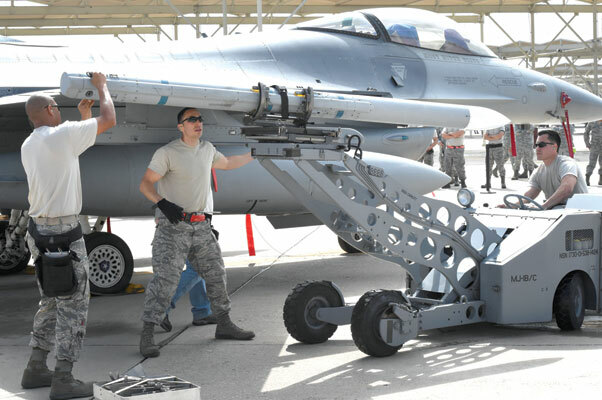 Mark Nash and Federico Barrios, and Senior Airman Robert Satter, aircraft armament systems technicians, load an inert AIM-120, advanced medium-range air-to-air missile onto the wingtip of an F-16 during the competition. Tech. Sgt. 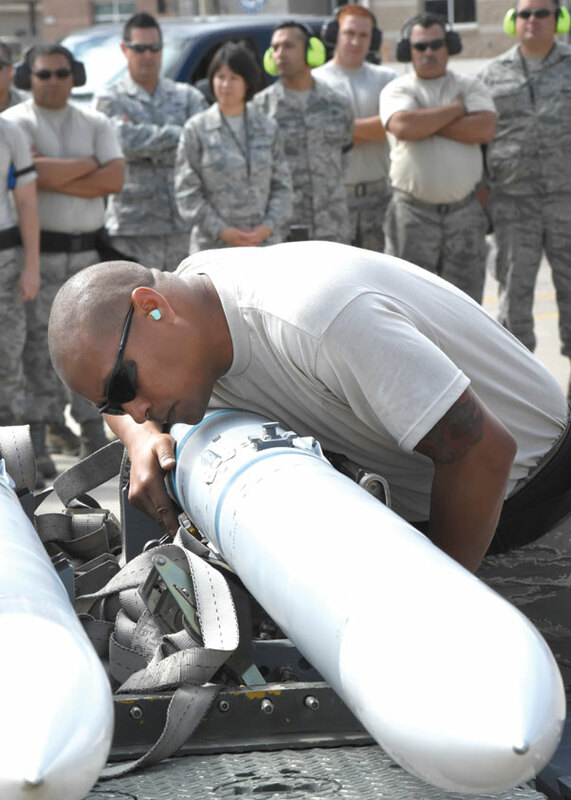 Federico Barrios, an aircraft armament systems technician, evaluates a wingtip missile launcher as part of the loading portion of the 56th Fighter Wing’s load crew of the quarter competition April 8 at Luke Air Force Base.